Yes, it is. Come August 2014, the OBOccasionals are determined to do it again. This time the tour destination is Kerava National Cricket Ground in Finland! The second historical OBOccasionals Tour will take place on the first weekend of August. And this time we're heading to Finland. 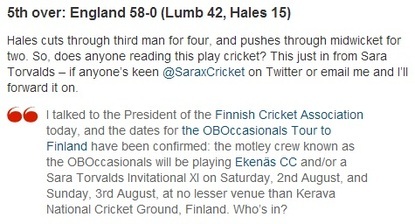 We've had confirmation from the Finnish Cricket Association that we can play at Finland's new National Cricket Ground in Kerava on Saturday August 2nd and Sunday August 3rd (and Kerava, for those of you who don't know, is just north of Helsinki and easily accessible by train). And as soon as the dates were confirmed, that was announced on the OBO as well. Clearly it is a good omen that England actually won the (meaningless) match (in a series that was already lost). Invitations have also been issued through The Guardian's OBO, naturally. To read the full over-by-over report of yet another loss Down Under click on the image above (for a dose of ODI pain) or the one below (for some T20 misery). Click here for our Accommodation page. It is so worth the click. OK, it's not. There's hardly anything there. If I were you I'd consider going straight to the trains page, simply because there's more stuff there. OK, click here for a touristy presentation of Helsinki. Be advised, however, that the OBOccasionals tour is not likely to take in quite so many churches. And that we offer no guarantees of the weather conditions. Except that it is bound to be warmer in early August than it is in January. Well, it's your choice, obviously. On your head be it. Click here for a video on the state of cricket in Finland circa 2013. That is so last year, though, and things have moved on endlessly since then, which is why on the same page we've stuck a link to some pics of the pavilion that has since been built at Kerava NCG. What's that? OK, click here for some very nice pics relating to Finnish Cricket Week. Yes, that is Kerava National Cricket Ground on a Google Map for you to ponder.